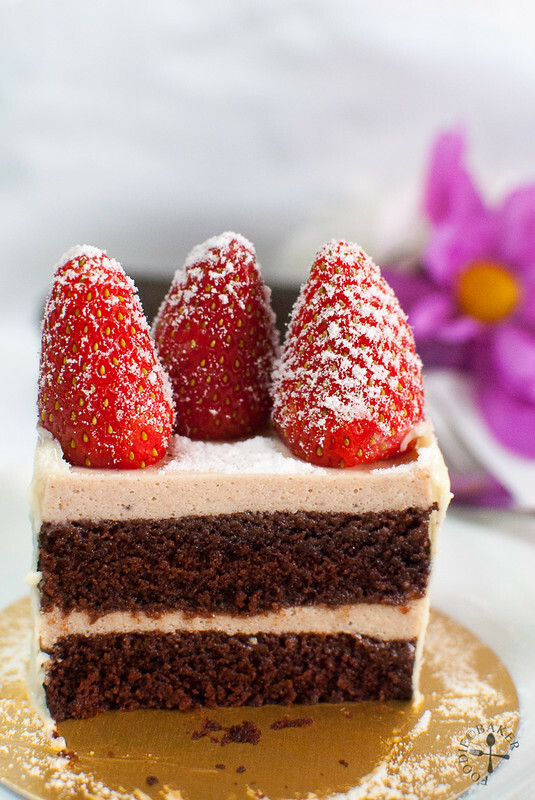 Just blogged about a layer cake recently and I’m back blogging about another one! This cake was made also for an early birthday celebration for a friend. I decided on a strawberry cake as Korean strawberries were on sale, so I bought 2 punnets and used 1 1/2 punnets for the recipe (including decorating). I actually wanted to try making a strawberry and white chocolate mousse but was afraid that it would be too sweet, so I opted for a bavarian cream instead. Bavarian cream, also known as crème bavaroise or Bavarois, is a dessert similar to pastry cream but is thickened with gelatin instead of flour / cornstarch. It is often flavoured with liqueur and lightened with whipped cream but as I didn’t have any complementing liqueur on hand so I omitted the liqueur. The bavarian cream is rich, smooth and not overly sweet, I think the cream can be served directly in small serving cups as mousse! 1) Wash and hull the strawberries. 2) Puree them in a blender and sieve to remove the seeds and lumps. 3) Sprinkle in the gelatin granules and let it soften. 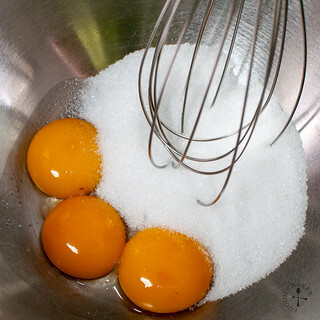 4) Whisk egg yolks and sugar together. 5) Until pale and thick. 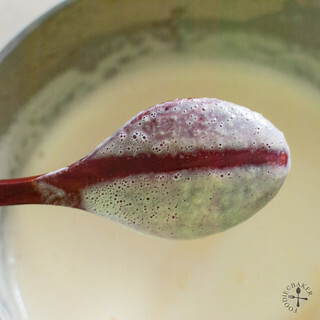 6) Bring some milk to a simmer - bubbles begin to appear ob the sides. 7) Temper the egg yolks (detailed description on tempering below!) 8) Pour the egg yolks mixture back into the pot and cook until thickened. 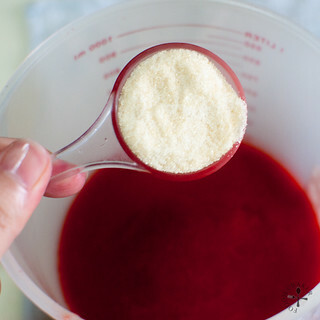 9) Pour in the strawberry-gelatin mixture and cook over low heat until gelatin has dissolved. Strain the mixture if there are lumps (optional!) 10) Remove from heat and stir in lemon juice. Set aside let it cool to room temperature. You can speed uo the process by let the bowl of strawberry mixture sit in a large ice water bath. 11) Whip some cream until medium-stiff peaks formed. 12) Whisk in 1/3 of the whipped cream into the cooled strawberry mixture to lighten it. 13) Gently fold in the remaining whipped cream. 14) Use immediately! Really love how the photos turned out this time! 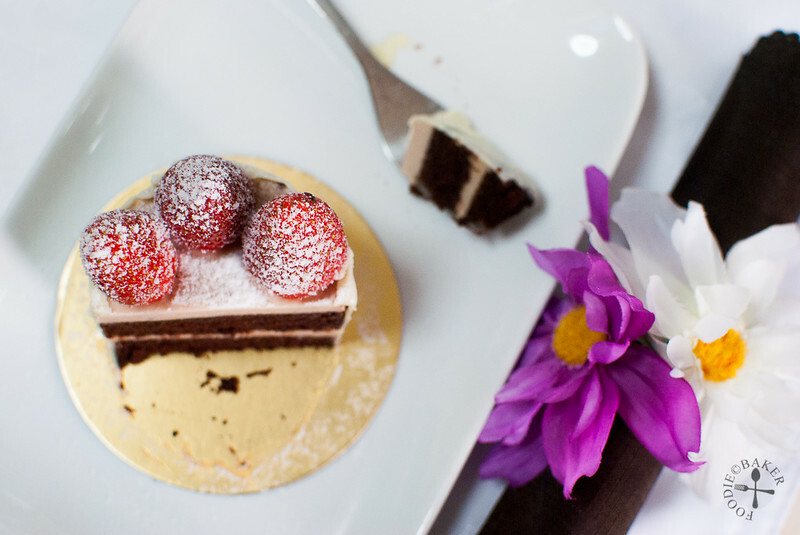 This recipe is for Aspiring Bakers #32: World of Mousse Cake (June 2013) hosted by Hankerie! Preheat oven to 175 degrees Celsius. Grease 2 9-inch baking tins and line the bottom with parchment paper. Set aside. Divide the batter between the tins and bang the tins twice each on the table counter to release excess air bubbles. Bake for 20 to 25 minutes until a skewer inserted into the centre comes out clean. Let the cake cool completely before cutting them into rounds. Sprinkle gelatin all over the strawberry purée. Set aside for at least 5 minutes. Whisk egg yolks and sugar in a small mixing bowl until pale and thick. Set aside. 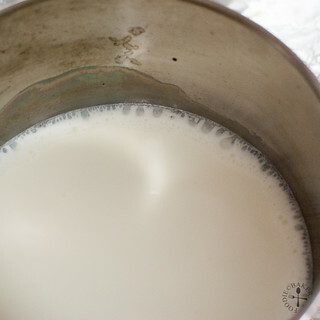 Place the milk in a medium pot and bring to a simmer or until small bubbles begin to appear on the edges of the pot. Temper the egg yolks with the hot milk. 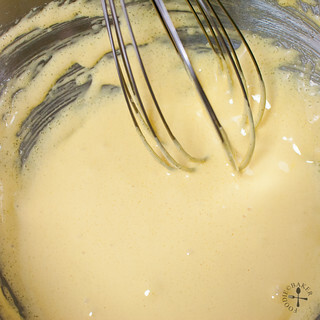 Transfer the egg yolks mixture back into the pot and continue to cook the custard over medium-low heat, stirring constantly with a wooden spoon until thickened. 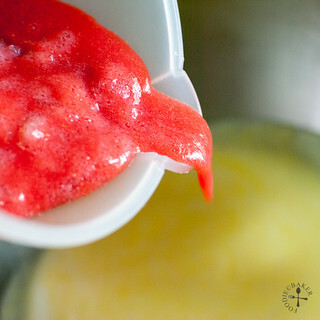 Turn the heat down to low and add in the strawberry-gelatin mix. Stir until the gelatin has dissolved fully. Remove from heat and strain the mixture to remove any lumps. Stir in the lemon juice and set aside to let the mixture cool to room temperature, stirring occasionally. Whip the cream until medium stiff peaks formed. Whisk in ⅓ of the cream into the strawberry mixture to lighten it, then fold in the remaining whipped cream. Use the cream immediately. 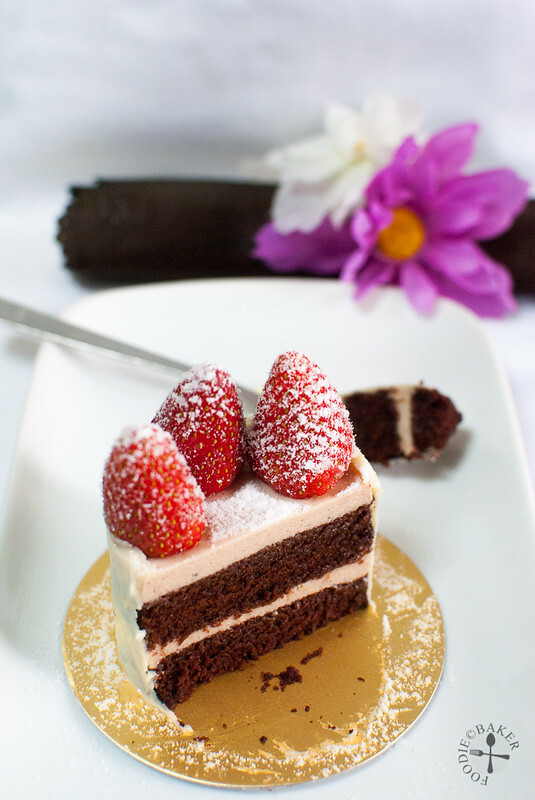 Cut the chocolate cake layers into 8-inch rounds. Place one round in a 8-inch ring mould (3-inch in height). Pour ½ of the Bavarian cream over the cake layer. 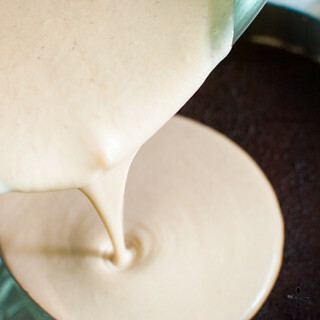 Place the other cake layer on top and pour in the remaining Bavarian cream. Refrigerate for at least 4 hours until the cream layer is firm. Wrap a hot towel around the sides of the cake and unmould the cake. Transfer the cake onto a serving dish. Cut a piece of parchment paper or plastic sheet such that it wraps around the cake and is of the same height as the cake (or a little taller). Spread white chocolate over the parchment paper and let the white chocolate set a little. Wrap the white chocolate collar around the cake and refrigerate until the collar is fully set. Peel off the parchment paper. 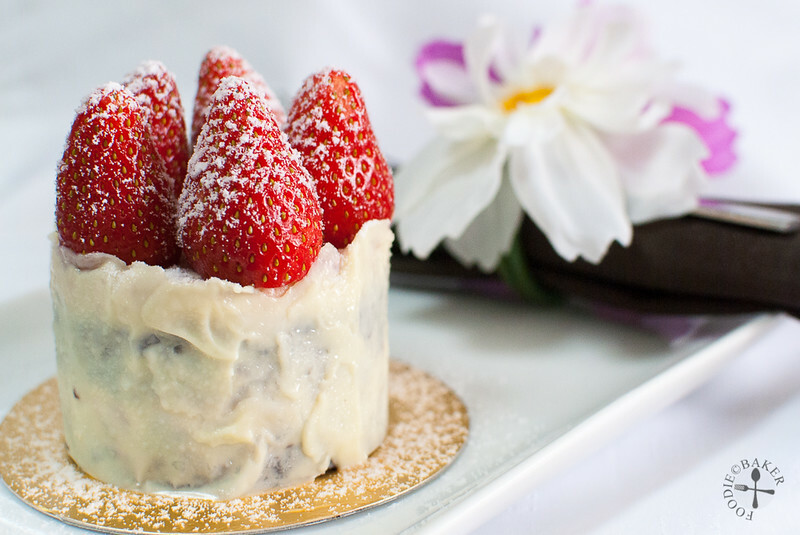 Decorate with strawberries and dust generously with icing sugar and serve! 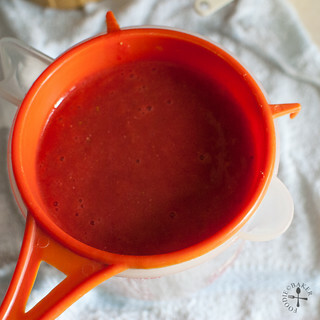 To yield 1 cup of strawberry purée, you’ll need about 250 grams of strawberries. 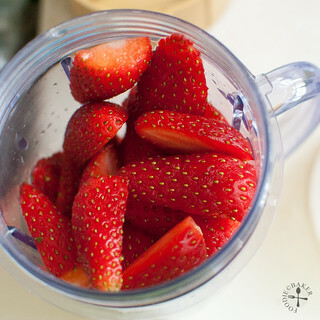 If your strawberries are on the sour side, add in more caster sugar into the egg yolks mixture. My strawberries are very sweet (Korean strawberries), so I used only 1/3 cup of sugar. Tempering egg yolks with hot milk: add in milk bit by bit, whisking the egg yolks constantly. When 1/4 of the hot milk has been added, add the hot milk in a slow and steady stream, still whisking constantly. 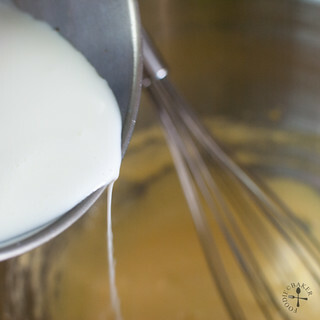 Once most of the hot milk has been whisked in, you can now return the egg yolks mixture back to the pot and cook. If you add the hot milk too fast at the start, you might end up cooking the egg yolks. 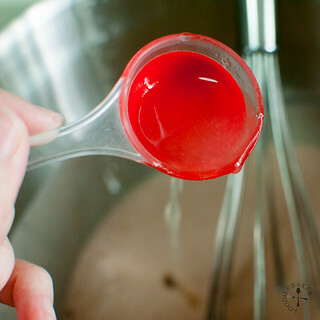 To speed up the cooling process of the strawberry mixture, you can place the bowl of strained mixture in a large bowl of ice water, stirring occasionally. 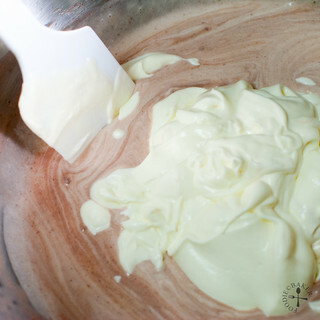 Whipping cream: Place the mixing bowl and beater in the refrigerator until very cold. 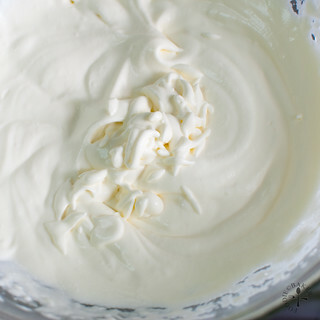 Place the mixing bowl over a large bowl of ice water and measure the whipping cream. 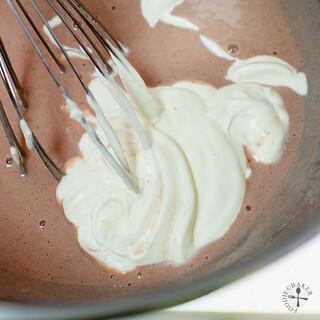 Using the electric mixer and the cold beater, whisk the cream until medium-stiff peaks formed. Don’t over-whip as you might end up with butter instead! Wow, this cake is gorgeous!! Just like something you would find at a fancy bakery!! I don’t just like it I LOVE it. What a beautiful cake, it’s my favorite combination of flavors, its perfection.